The Nisqually River drains the southwest slopes of Mount Rainier, a glaciated stratovolcano in the Cascade Range of western Washington. The Nisqually River was impounded behind Alder Dam when the dam was completed in 1945 and formed Alder Lake. 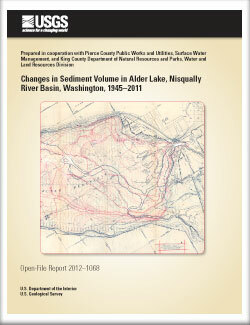 This report quantifies the volume of sediment deposited by the Nisqually and Little Nisqually Rivers in their respective deltas in Alder Lake since 1945. Four digital elevation surfaces were generated from historical contour maps from 1945, 1956, and 1985, and a bathymetric survey from 2011. These surfaces were used to compute changes in sediment volume since 1945. Estimates of the volume of sediment deposited in Alder Lake between 1945 and 2011 were focused in three areas: (1) the Nisqually River delta, (2) the main body of Alder Lake, along a 40-meter wide corridor of the pre-dam Nisqually River, and (3) the Little Nisqually River delta. In each of these areas the net deposition over the 66-year period was 42,000,000 ± 4,000,000 cubic meters (m3), 2,000,000 ± 600,000 m3, and 310,000 ± 110,000 m3, respectively. These volumes correspond to annual rates of accumulation of 630,000 ± 60,000 m3/yr, 33,000 ± 9,000 m3/yr, and 4,700 ± 1,600 m3/yr, respectively. The annual sediment yield of the Nisqually (1,100 ± 100 cubic meters per year per square kilometer [(m3/yr)/km2]) and Little Nisqually River basins [70 ± 24 (m3/yr)/km2] provides insight into the yield of two basins with different land cover and geomorphic processes. These estimates suggest that a basin draining a glaciated stratovolcano yields approximately 15 times more sediment than a basin draining forested uplands in the Cascade Range. Given the cumulative net change in sediment volume in the Nisqually River delta in Alder Lake, the total capacity of Alder Lake since 1945 decreased about 3 percent by 1956, 8 percent by 1985, and 15 percent by 2011. Czuba, J.A., Olsen, T.D., Czuba, C.R., Magirl, C.S., and Gish, C.C., 2012, Changes in sediment volume in Alder Lake, Nisqually River Basin, Washington, 1945–2011: U.S. Geological Survey Open-File Report 2012–1068, 30 p.